Oura’s purpose is to help you live your life to the fullest; so that you feel well-rested and energetic, ready to take on the day. The key how to live one’s life to the fullest starts by finding the proper balance and timing between two very important factors: rest and activity. Rest and activity influence each other. Our bodies and minds are built to be active, but every activity leads to a need for rest. When you’ve rested, you’re ready to go again. Also, the activity you get during the day has an effect on your sleep and recovery, and the quality of your sleep and recovery has an impact on your readiness to perform both mentally and physically. The timing of rest and activity also matter. Even though we live by the earth’s 24-hour circadian rhythm, we all have our unique alignment to that rhythm. In order to live your life to the fullest, it’s important that you know what the optimal time is to sleep, eat, and be active. 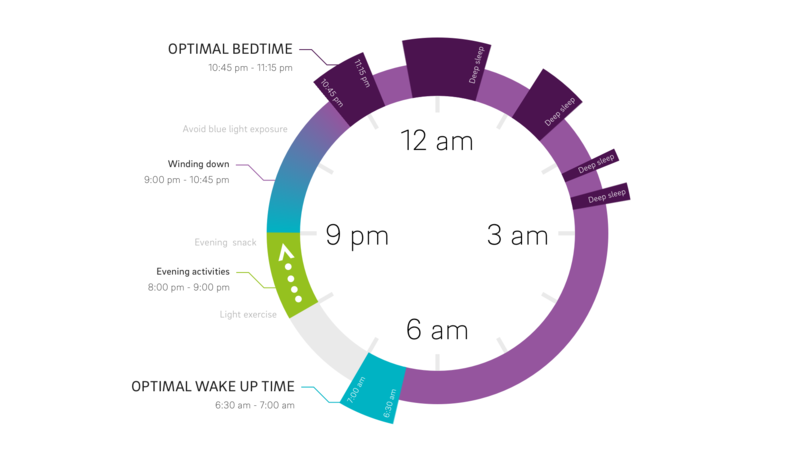 This is why Oura tracks your sleep, recovery and activity, and guides you to find your own unique, optimal daily rhythm. Below you can read more about sleep and recovery, as well as activity. Rest is at the very core of your health and wellbeing. First, sleep is vital: your body and mind cannot operate without it. It’s during sleep when your body and mind recover from the strains of your day, and recharge to be ready for the next day. Second, even the mightiest warriors need restful periods during their days, and times for recovery during their weeks. It’s common knowledge among athletes that peak performances are fueled by recovery. With the insights, guidance and knowledge Oura gives you about your restorative sleep , you learn how your daily rhythms influence your body and mind. We take a holistic view on activity: for us, both your activities and inactivity play a role in your wellbeing. And it’s not just a single activity or a day that matters, but days, weeks, and months – your overall lifestyle. So, when we talk about activity tracking, we talk about two sides, inactivity and activity, and two perspectives, daily and long term. First, we know too much stationary time per day causes negative health effects. It can also diminish your sleep and recovery quality. Everything you can do to avoid excess stationary time, such as sitting or standing still for long periods of time, is therefore beneficial to you. That’s why Oura gives you insights into your periods of inactivity, and guides you to break them up. Second, regular exercising does you good, and can improve your sleep quality. But it’s not just the exercise that matters, but your overall everyday movement. By analyzing your activity as a whole, Oura gives you insights on your daily activity load, and guides you to find an optimal fit between different levels of activities. Third, every day is different. It’s important to know when it’s time to rest, and when there’s a chance to break records. By analyzing your body’s signals and sleep quality, Oura gives you daily guidance on how recovered and ready you are for the day – both physically and mentally. Finally, it’s the load from previous days that influence your readiness today and tomorrow. That’s why Oura’s guidance is based on a longer-term view on your recovery and activity. It’s our goal to help you find a lifestyle that suits you, and long-term data is in a key role in that. Want to feel your own life in balance? The new Oura ring is now available for pre-order. Shop now.